Go right read it right C'hERE!! It is of The Soul Rebels Brass Band and their rousing set at Brooklyn Bowl on Friday Night. Great venue, amazing sound all over, we spent part of the show almost as far away from the stage as possible and it still sounded dope, they could use more outlets to get drinks to people but otherwise a great night. The opener was Afroskull, but when I talked to the baritone player post show he mentioned the band was sort of a mashup between Afroskull and Outer Borough Brass Band. Either way the grooving sounds coming from the stage would be music to any fan of the jam-band scene's ears while still engaging a funk crowd. The break was short when the Soul Rebels began their march to the stage and the rests would be brief over the next few hours as the band just blew and blew the night away. 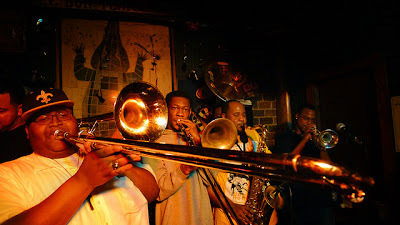 It is so hard to pick a favorite Brass Band currently on the scene as all are so tight, but Soul Rebels party's may be the funnest as they are just there to have a good time and throw down. They are certainly high on the list of RtBE's favorites. The covers and snippets help get first timers to groove and keep things fresh for both fans and players alike. the group is worth your time and hard earned money, so check them out when they cruise to your neck of the nape. Tour dates here. No doubt one of the best BB's in the city!